The reading of the Haggadah is a time-honored tradition during Passover Seders. Detailing the story of the birth of the Jewish nation, the vivid narrative focuses primarily on the miraculous events in Egypt which led the Jews from slavery to liberation, but also spans the entire period from Abraham to the giving of the Torah on Mount Sinai. The text is a celebration of Jewish endurance and continuity, and in the context of a father son dialogue, the story goes directly to the heart of our national consciousness answering who we are, from where we came, and what it is that we stand for. Quite the popular Jewish book, there are have been an estimated 2,000 editions of the Haggadah published over the years. At Zion Judaica, we are proud to offer a huge variety of the many flavors of the sacred text available. The comprehensive Liberty Haggadah contains the traditional text so central to the observation of Passover along with personal testaments to the significance of the holiday through photographs, stories and artwork celebrating the holiday and the resilience of the Jewish people. Our beautifully illustrated children’s Haggadah features full color images that bring the story to life, and is perfect for keeping young children awake. Our various translated Hebrew English text Haggadahs are an ever popular choice, and our beautiful Pasover Spring Haggadah is indeed, a true work of art. It is finished with a gold-embossed color and its pages are filled with priceless pieces of Hebrew legend, making it an outstanding addition to any Haggadah collection, or a great gift for a leader of a Seder ceremony. 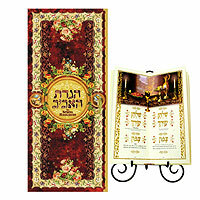 Shop Zion Judaica for an unmatched selection of Haggadah texts for any lover of Judaica in your life.